There are a few important things to understand about dental insurance. First, is that most plans run on a calendar year system, meaning that benefits start in January and end in December. Most plans also have a yearly maximum ranging from $1000 to $2000, which is the highest amount your insurance plan will pay for your dental treatment each year. Since these dollars don’t roll over into next year’s benefits, if you don’t use them in 2018, you will lose them. What does this mean for you? That it is important to determine if you have had two cleanings and checkups this year and completed any treatment that was recommended before your benefits run out, and you lose your dollars. 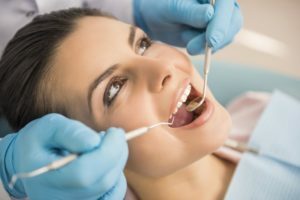 The focus of dentistry is prevention, and that is why most typical dental plans will cover your six-month cleaning and checkup appointments at 100%. Since there is little to no out-of-pocket cost for you, it is to your advantage to use this benefit and visit your dentist twice each year. Preventive care helps you avoid more significant problems in the future such as tooth decay and cavities because your dentist can detect them early on. For example, if your dentist finds tooth decay during your routine examination, and you are proactive about treating it right away, it can often be treated with a simple dental filling. A filling is a less complicated procedure and won’t require recovery time. Ignoring tooth decay could result in the need for a more significant and costly procedure. Do You Have Questions About Your Dental Benefits? We are happy to answer any questions you have, review your dental insurance with you, and determine which treatment or appointments you should schedule before the end of the year. Give your Richardson dentist a call today for more information. Canyon Creek Family Dentistry combines the talents of three experienced dentists to bring families in Richardson, TX the highest quality dental care available. We offer stress-free dental care in a warm and caring environment, and patients love the personal attention they receive. We also make dentistry convenient for your schedule by offering morning, evening and Saturday appointments. If you would like to contact our team, we can be reached by calling 972-644-3800 or through our website.